We are very sorry to inform you that the “You’ll Never See Finland tour” featuring GRAVE (Swe), DEMONICAL (Swe) and AUTHOR (Fin) has been canceled! The reason for the cancelation is “work related matters within the Grave camp”, info that was passed on to us today during the afternoon (August 17). We have not received any further- nor more detailed explanation but the fact remains, the tour will not happen! We at Dreamtide Music tried our best to find a replacing (headliner) band suitable for the package, audience and local promoters but found it impossible with such a short notice. We are very sorry for the whole situation and we would like to apologize to all fans, promoters and touring partners (DEMONICAL and AUTHOR) for the inconvenience this might cause. For ticket refunds please contact the place of your purchase. GRAVE and MALEVOLENT CREATION, two of the most legendary and longest running death metal bands, will team up for a tour, starting in November, to bring pain, plague and punishment unto the people of Europe! MALEVOLENT CREATION’s new album “Dead Man’s Path” and GRAVE‘s “Out Of Respect For The Dead” are both out now via Century Media Records. What could be more fitting than sending those two veterans from the glory days of death metal together on tour to wreak havoc and devastation? Both bands will share the headlining position, rotating every show. So expect two headliner sets per evening! The full front death metal assault! Do not miss this killer package!!! Swedish death metallers GRAVE have unleashed a new track, “Plain Pine Box” from their upcoming album “Out Of Respect For The Dead” via VICE’s music channel Noisey. Check it out HERE. Released worldwide on October 16th 2015, via Century Media Records, expect nothing short of pure evil in the following formats; Standard CD, Deluxe LP, Deluxe 2CD box set and digital download/stream. 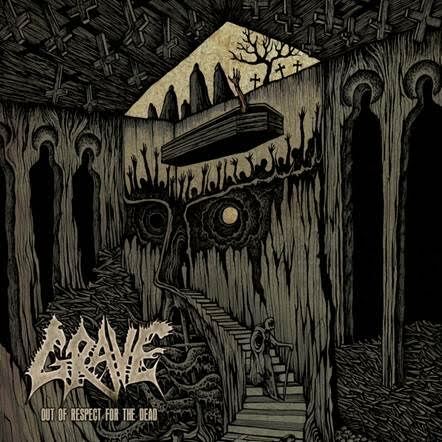 GRAVE have revealed the cover artwork for their upcoming album “Out Of Respect For The Dead”, which is set to be released worldwide on October 16th 2015. The artwork was again done by Costin Chioreanu, who has been responsible for the band’s last three albums as well as the “Morbid Ascent” EP. Chioreanu is also known from his works for bands such as At The Gates, Paradise Lost or Arch Enemy, to name a few. “Out Of Respect For The Dead” is going to be released as Standard CD, Deluxe LP, Deluxe 2CD box set and digital download/stream. Swedish death metal rulers GRAVE have finished the recording for their eagerly awaited new album, “Out Of Respect For The Dead”. Three years have passed since the release of GRAVE ’s last opus, the highly praised “Endless Procession Of Souls”, that was followed by a European headlining tour together with Sonne Adam, the release of the vinyl-only “Morbid Ascent” EP and another tour together with their label mates Entombed A.D. Since autumn 2014 GRAVE have constantly been working on the follow-up album of “EPOS”. Now “Out Of Respect For The Dead” is finally done. And it turned out to be one of the angriest and most evil albums of the band’s career. “Out Of Respect For The Dead” will be released through Century Media Records in October. Century Media Records will release a vinyl re-issue “Into The Grave” of Swedish death metal act GRAVE‘s phenomenal 1991 debut album on June 1st, 2015! Considered a milestone of the genre alongside such classics as “Left Hand Path”, “Like An Ever Flowing Stream” or “Where No Life Dwells”, it’s an essential album that belongs in every proper death metal collection. The 2015 edition is visually based upon the first-pressing LP in terms of album sleeve layout yet shows the wonderful Axel Hermann artwork (Asphyx, Morgoth, etc) unobstructed with the silver logo of the original LP. Hermann recently provided the cover in astonishing quality thus it looks even nicer than ever before! The music remained the same and sounds as blistering and brutal as ever, so enjoy this masterpiece of Swedish death metal! The European preorder is online now, so grab it HERE. The US preorder will start soon! Stay tuned for further announcements. Right now, GRAVE are working on the much-anticipated follow-up to 2012’s “Endless Procession Of Souls” album, stay tuned to their facebook page for updates from the studio.